Old Trafford, Manchester - Manchester United Blog: Giggs to the rescue; 900 not out for the Welshman. Giggs to the rescue; 900 not out for the Welshman. As we expected, Giggs and Welbeck started the game today at Carrow road. The two were instrumental in turning the game at Old Trafford back in October so it was no surprise that both were named in the starting line up today. It must also be mentioned that Ryan Giggs made his 900th appearance for Manchester United in this afternoon's match; an amazing achievement - truly amazing. The fact that it was Giggs who eventually won the game for the reds was a wonderful touch; a moment that warmed the hearts of United fans everywhere. United made a bright start to the game, scoring after only seven minutes through another Old Trafford legend, Paul Scholes. As we can see from the Player Influence chart below, Scholes and Carrick were the key players in the opening seven minutes - the period that led to United's opener - but interestingly, the reds were not in an overly attacking formation at the time. Much of the play was narrow with the exception of Jones on the right; Henandez and Welbeck were both deep, with Welbeck adopting the 'Rooney' role in front of the midfield while on the left, Giggs and Evra were virtually anonymous. And yet United took the lead. After that the match settled into a frustrating pattern (from a United perspective). The reds found themselves unable to add to Scholes' opener and, at various stages, were forced onto the back foot. The next chart shows the period between Scholes's goal and Holt's equaliser. During this period, United's formation and positioning remained largely unchanged. Hernandez, in particular, struggled to get into the game, finding himself very deep most of the time. 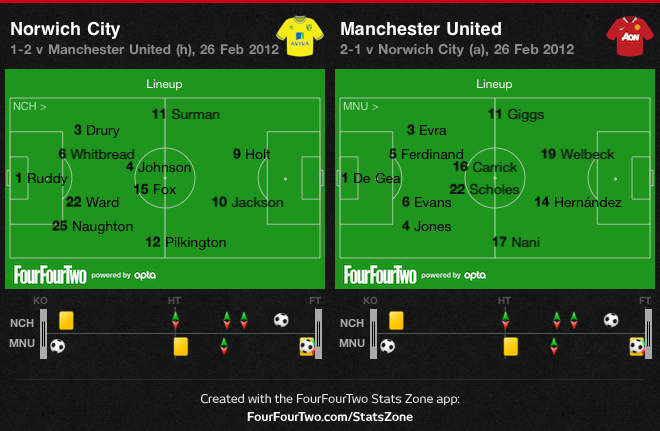 Carrick and Scholes maintained control for the most part but up front for United, it just wasn't happening. At the other end, it should be noted that De Gea had a solid afternoon in goal when called upon. He had no chance with the Norwich goal. The next chart shows United pushing to grab the winning goal. Norwich equalised on 83 minutes. It was then up to United to to respond and keep pace with City in the title race. With time running out, the reds piled forward in search of a winner. During this period, Nani finally got wide on the right, as did substitute Young on the left. 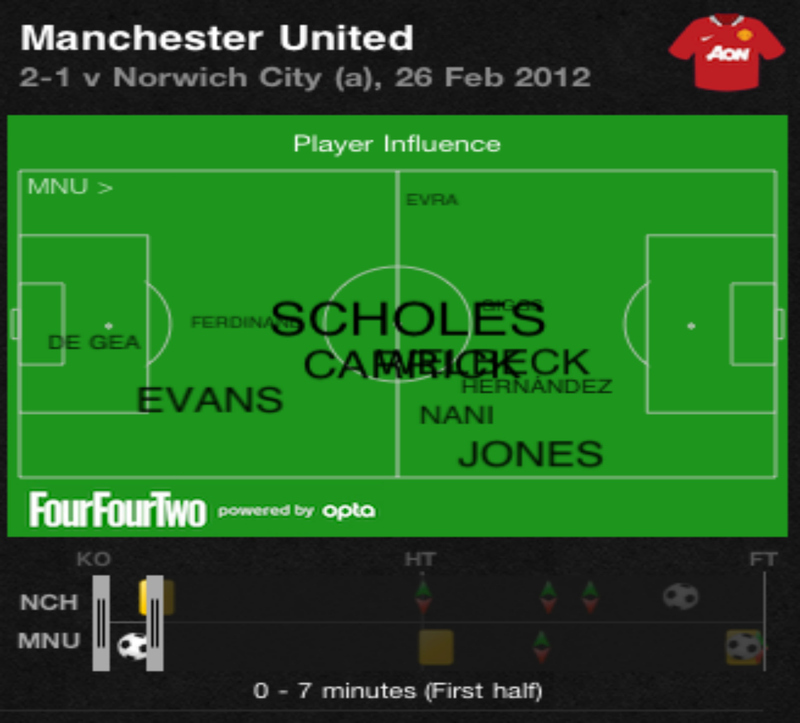 Michael Carrick and Paul Scholes advanced significantly in the middle, while Giggs pushed up in support of Welbeck. It was no surprise then when the Welshman popped up at the far post to knock Ashley Young's cross into the back of the net. As was the case at Old Trafford in October, United were made to work for the points against Norwich. For much of the game, the reds were made to look sluggish and workmanlike. Nani, in particular, was poor (although he created a goal as we speculated in a previous article) while Giggs struggled to provide width on the left. In the middle, Michael Carrick played well, keeping things ticking over and 'playing time' - to use a cricketing expression - as he does. It was no surprise to find him at the top of the passing charts once again, completing 88 out of 101 attempted (see chart) and all around the wicket too. Paul Scholes did likewise in his timeless fashion; while in defence, Rio and Evans were reasonably assured and solid. By contrast, Danny Welbeck was in the thick of the action, assuming Rooney's deeper role, but his finishing was wayward; making a particular mess of an inviting header late on.